Photos of the Spanish Galleon El Galeon Andalucía on 10.14.2014 by George Kane. This replica ship was built about 6 years ago in Spain and originally was a armed cargo vessel. 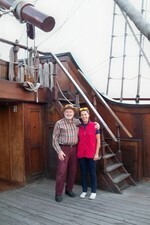 I saw one female crew member who spoke very good English so I had one of the other crew members take a photo of us. All the crew members I spoke with were Spaniards and spoke English well. 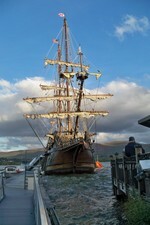 The ship was at the Newburgh waterfront until Saturday Oct 18th.